Q4® Plus Turf Herbicide for Grassy & Broadleaf Weeds from PBI-Gordon combines four powerful active ingredients into a single formulation that kills tough grassy and broadleaf weeds, including yellow nutsedge, crabgrass, foxtail, chickweed, clover and dandelion. Q4 Plus is highly selective in cool-season turfgrasses and labeled for select warm-season turf species making it ideal for use in perennial and annual ryegrasses, and listed bluegrasses and fescues. 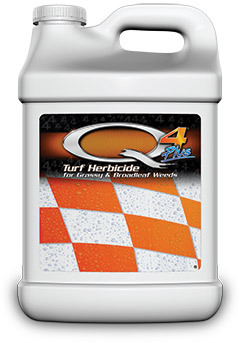 Labeled for use on golf courses, residential and commercial areas, cemeteries, sod farms and roadsides, Q4 Plus offers rapid visual response and has a one-week reseeding interval for most listed turf. For more information visit GordonsProfessional.com.